We have said goodbye to an immensely talented artist and champion of the human spirit. Charles Aznavour blessed the world with his remarkable brilliance, most notably a voice that could reach and capture the deepest confines of hearts and souls. He was one of the world’s most celebrated and well-known singers and song writers. He also stood out as a true humanitarian whose Armenian roots were inextricably woven into the spirit and intentions of his incredible philanthropic work. Aznavour was a crusader for the underprivileged. He established his own foundation, Aznavour for Armenia, following the 1988 earthquake. When the Soviet Union crumbled, he was a great supporter of independence and dedicated himself to helping the country through its challenging transition. He was also a diplomat, eventually becoming the Swiss ambassador of Armenia and Armenia’s permanent delegate to the UN at Geneva. FAR had a unique connection with Aznavour. During the late 1990s, we inherited Vanadzor Old Age Home (VOAH) from his foundation. Today, VOAH, an assisted living community for low-income seniors, remains one of our strongest projects. 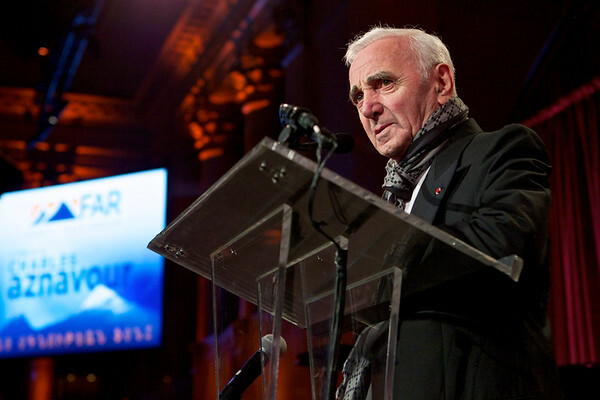 In 2011, FAR honored Aznavour at a reception in New York; Aznavour requested that all proceeds be directed to VOAH. Aznavour was an artistic visionary, a hero, a pioneer, not only to the Armenian community but to the world. We at FAR will continue to fortify his legacy and his spirit and memory will live on within us all. Read Aznavour’s 2011 interview with Florence Avakian in “Yerevan” Magazine here.